Their last holiday – from what I can ascertain – was a beach holiday on an island a few thousand miles away in one of those self contained all-in resorts where you get all your meals, all your drinks and all your entertainment without having to leave the complex. Unless you want to go on a boat ride or a fishing trip in which case you might escape their clutches for a few hours but don’t be back late for your early afternoon cocktail! Such places for my money aren’t seeing the world. They’re about seeing a homogenised, generic, pretty universal and plastic hotel that just happens to be somewhere hot and where the colour of the sand is almost albino. Even if the native sand is black someone will regularly ship in a batch of the white sand to cover it because half the clientèle aren’t even aware that you can actually have black sand naturally and if they did it would blow their minds so much that they’d spend all their time either a nervous wreck, or complaining to the hotel manager. Plus the black sand won’t look half as pretty in the brochure. However the “World” doesn’t have a monopoly on fantastic views and Britain has some absolutely amazing scenery and beautiful countryside. Of course most (hey, probably all) countries do, but as Bill Bryson noted once, it’s not that Britain has more scenery than anywhere but that there’s so much of it so close to each other and so easily accessible. To be fair to our “seeing the world” friends, one of the “problems” with Britain is that the best views are always by foot and there aren’t that many scenic roads like there are in some other countries. You won’t see the amazing Seven Sisters, the outstanding High Cup Nick, the awesome beauty of the Eden Valley unless you put your boots on and head for the hills. And most people just won’t do that. Coincidentally, all this was swimming round my head the day after finishing The Dales Way where I had, err, seen lots of frankly amazing and stunning views that, well, err, you can’t see any other way bar putting your boots on and heading for the hills. I didn’t have much planned that morning – just needed to get to Windemere station for a train around 12 so I had a morning free to pootle around and do whatever. 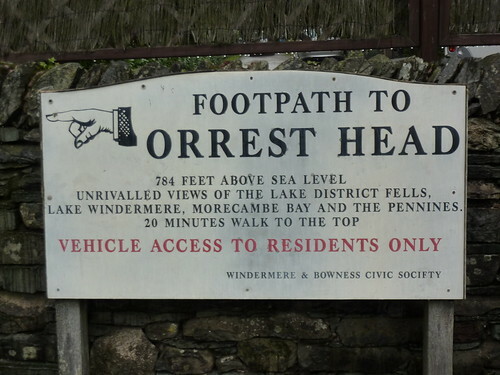 Before I’d left Catherine had pointed out what she proclaimed was a nice viewpoint at Orrest Head, and I devised a little route I could take from the hostel over various paths to arrive at the hill and soak in the views before heading to town. It was such a good route that I’d devised that I found the YHA had beaten me to it and had a batch of walking instructions for sale for 50p. 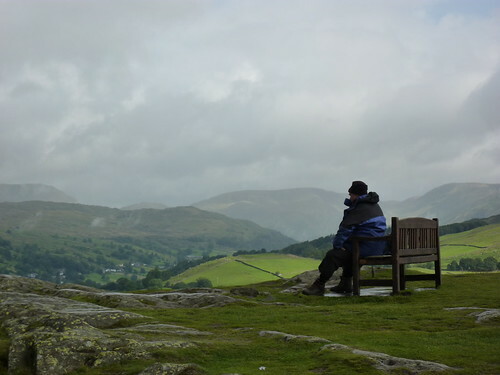 As I was in the Lake District it was naturally raining when I set off up the road to a pretty little hamlet and off into farmland. Being a short walk, I’d not bothered with waterproof trousers and instantly regretted it as my legs became more and more sodden; but hey I was in a fine mood even if I did take a wrong turn in a field of sheep who stared at me curiously as I did my return lap past them. Everywhere was in gloom so I didn’t expect to see much at Orrest Head when I got there but never mind – it’s all part of the game. Still squelching my way to the top I found the viewpoint, complete with a solitary man sitting on a bench huddled in waterproofs. The cloud didn’t clear but all of a sudden the rain stopped and the view was amazing. Even with the low cloud Lake Windermere looked beautiful and at its northern end, near Ambleside, the clouds were beautifully backlit by some hidden sun. Windermere always has an effect on me. I always end up formulating plans to go home and tell Catherine we’re leaving London as I’ve just bought a B&B in Bowness. Even on a soggy, cloud-filled day like this it’s so beautiful, so magical, so tranquil, so delightful. Slowly but surely we were joined by other hardy fools approaching the top from the main path and there were soon ten of us staring out at the wonder of it all, taking photos and soaking it all in. I must have sat and stood for easily twenty minutes gazing around wondering why anyone, anyone at all, would “see the world” but deliberately make a decision not to see a wonder like this. And then I headed down the hill. It started raining again but that was all right. The joy of it all still filled me and would for most of the day as I headed for the station for the first of three trains. It took the third train – insanely dirty and nearly an hour late to dampen my spirits. But hey, that was all right. For I was still happy. Cos I’d seen part of the world. It was a really lovely part; truly outstanding. And I hadn’t had to go on a plane, learn another language, drink a cocktail, stay in a plastic hotel or anything. First Published: 21 January 2011. Last Updated: 28 August 2015.